There’s hardly a traveler who has not, at least momentarily, wished for a leisurely week spent at a classic yet modern farmhouse in Tuscany. What better home base for exploring the countryside? What better setting for visiting with family and friends than in front of an outdoor fireplace at a long table with bottles of Chianti, plates of pasta and a perfect hillside view? 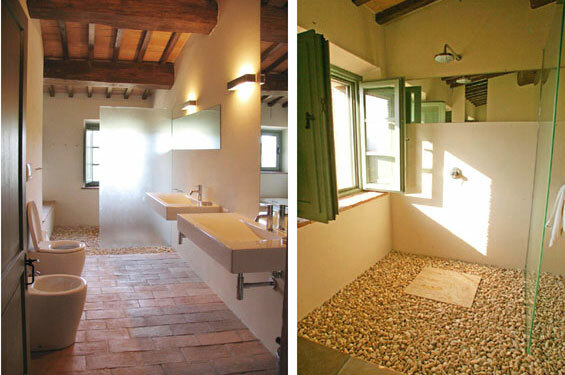 A restored stone house that’s mere miles away from Italy’s best vineyards and thermal pools is the most ideal locale. The Podere Palazzo in Tuscany, nearly smack in the middle of Rome and Florence, is therefore an ideal hideaway. With five bedrooms, three fireplaces, a pool and views on all sides it would be hard to leave.